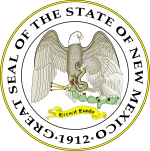 The New Mexico gubernatorial election of 1998 contest to elect the next Governor of New Mexico. The winner of the election would serve a term from January 1, 1999 until January 1, 2003. Incumbent Republican Governor Gary Johnson was eligible and ran for re-election and was re-elected. As of 2019, this is the last time a non-Hispanic was elected Governor of New Mexico. This page was last edited on 12 April 2019, at 06:47 (UTC).